I've been juicing up carrots with a centrifugal juice extractor. There's a lot of overhead (prep and cleanup) so it makes sense to do a big batch and keep it in the fridge for a couple of days. The pulp has precipitated to the bottom and retains its pleasant orange hue, but the juice has turned an ugly and unappetizing brown. It tastes better than it looks, but the flavor has suffered too. It's pretty extreme at 48 hours, but there is significant browning even at 24. I'm using refrigerated carrots and putting the juice immediately in a plastic screw-top (Ziploc) container in the fridge. 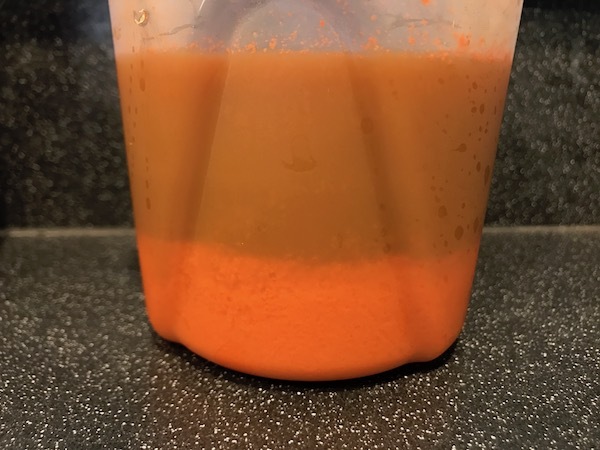 Is there anything I can do to keep my carrot juice looking and tasting fresh? This is classic enzymatic-oxidation browning. Two main culprits - oxygen and a group of enzymes (polyphenoloxidases) that promotes a reaction between oxygen and polyphenolic compounds in the juice. The juicing action will inevitably end up stirring into the liquid a lot of air which will end up dissolved in it. Air has 21% oxygen in it. Solubility of gases improves with lower temperatures. So, cold juice will hold more oxygen, and warm juice less. Unless you do your juicing inside a sealed cupboard filled with nitrogen, you will not be able to exclude oxygen from getting inside your juice. At lower temperatures, the enzymes become less active which will slow down the browning and counter the higher concentration of oxygen in your juice, but given enough hours, browning will still happen. You can try putting a barrier on the surface of the juice (a sheet of parchment or plastic for example) as soon as you finish juicing and before you put it in the fridge to prevent more oxygen from dissolving into the juice as it chills. It is unlikely to stop the browning. You can restrain the enzymes by making the juice more acidic, with lemon juice for example, or vitamin C as suggested above (the key is pH not how much Vitamin C it naturally has) or citric acid. That would only slow down the browning and you might not like the altered taste. You can deactivate the enzyme permanently by heat which means heating the juice to at least 65C, or better still, heating the carrots before juicing to well beyond 65C briefly. I suggest cutting the carrots into smaller pieces and putting them into a very hot water with any of the above acidic additives. I am sure heating will inevitably affect the taste, but it will stop the browning. It works with apples and pears. You can play with timing so that you destroy a certain amount of the enzymes, enough to have a good compromise between less browning and less taste change. There are suggestions you find online such as freezing. You can freeze your juice, but again it would only slow down the browning a bit more, it will still happen given enough hours. Other more extreme (and normally impractical) ideas include vacuuming the juice to extract dissolved gases from it, or using UHT and high pressure methods to break the enzyme. I typically use 65C acidic water to blanche whatever fruit or vegetable, and I use a barrier on the juice surface before storing/chilling. This is very common for centrifugal juice extractors and one of the reasons why the juicers crowd prefers masticating juicers. Of course, the solution is not practical for everyone, and it does not completely prevent this type of browning and separation, but it does slow down. 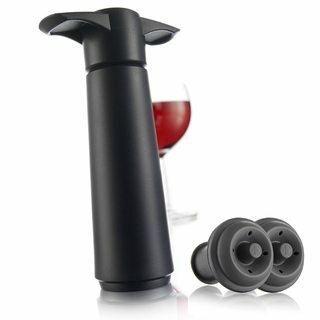 Based on Paparazzi's comment, I'd store it in a cleaned wine bottle and use a stopper/air-remover like a vacu-vin. That's a brilliant comment. Not the answer you're looking for? Browse other questions tagged storage-method juice carrots enzymatic-browning or ask your own question. How can I prevent pear juice from soaking into pastry dough?